Several weeks ago my friend brought me in a butternut squash from her family’s farm. I’m not a huge fan of butternut squash but a few weeks ago I went to a fall dinner at a local restaurant and had the most incredible butternut squash mashed potatoes. I was hoping to be able to recreate these potatoes at home with the butternut squash. In addition to the butternut squash I needed to pick up some potatoes and there’s no better potato then an Idaho Potato! Thinking about Idaho Potatoes make me think of Mr. Potato himself, Don Odiorne who is celebrating his 70th birthday! 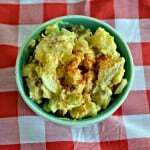 Many of us who are part of the Sunday Supper Movement have joined together today to share a potato recipe to help celebrate Don’s birthday! I had the pleasure of meeting Don at last year’s Food Wine Conference and I can’t wait to share this delicious recipe to help him celebrate his big day! So let’s talk about these potatoes. I’ll be honest when I say I haven’t made a whole lot of homemade mashed potatoes. While I love mashed potatoes when I make a potato dish it tends to be baked so I was really starting from scratch on this recipe. I had nothing to go on except my tastebuds and a side dish I had 3 weeks ago. I started with the easy part. I peeled and chopped both the potatoes and the butternut squash into 2 inch pieces and placed them in a pot of boiling water. I boiled them for about 15 minutes then drained them and returned them to the pot. Here is where things got a little bit tricky. I know that potatoes have butter, milk, and seasoning in them I wasn’t exactly sure how much so it was a process of trial and error. I used a mixer to get the potatoes and squash smooth and was happy to see the gorgeous orange color of the potatoes. I mixed in the milk and butter as well as fresh chives and parsley from my garden. A sprinkle of salt and pepper finished them off. I have to admit these were really tasty. 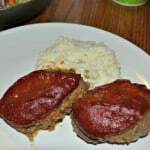 While they were not exactly like the ones I had at the fall dinner, they were pretty close and I loved the flavor. 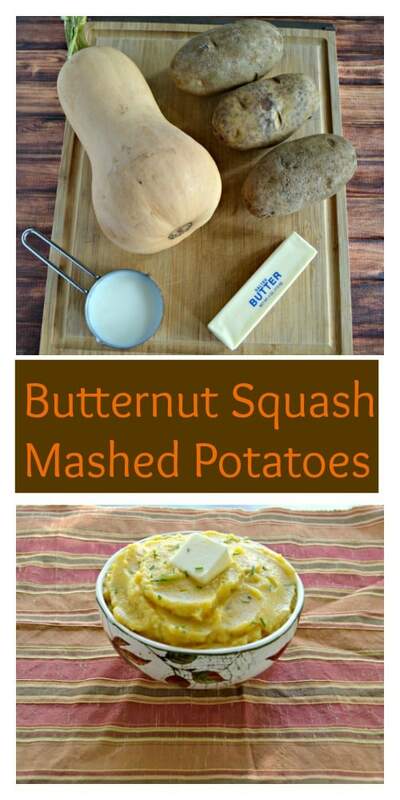 They were rich and creamy from the milk and butter but had subtle flavors from both the potatoes and squash. Even my husband who is not a big butternut squash fan enjoyed these mashed potatoes. I’ve decided I’m going to make them for Thanksgiving dinner. 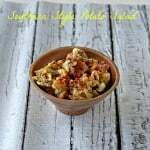 I think they will be the perfect side dish for a fall holiday dinner. I also think they are the perfect thing to help celebrate Don’s 70th birthday! Happy Birthday Don! 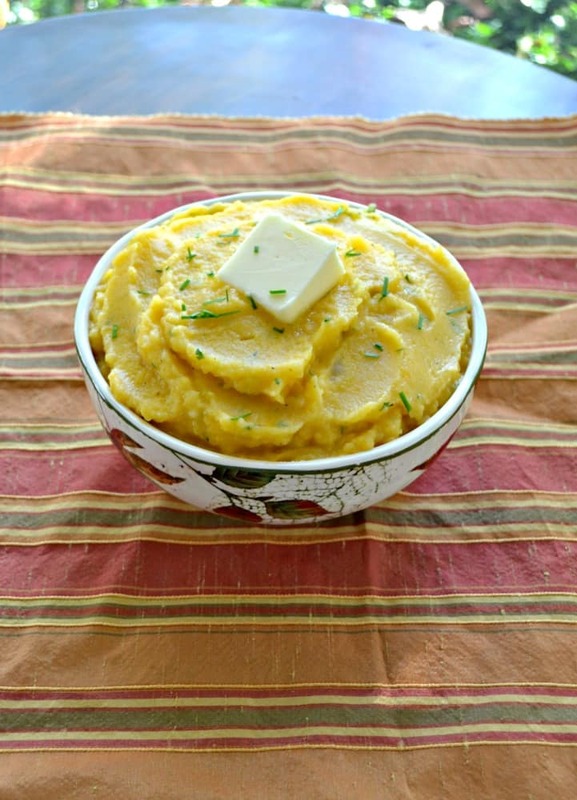 A fun fall twist on classic mashed potatoes you'll love the addition of butternut squash! Peel the butternut squash, scrape out the seeds, and cut into 2 inch pieces. Set aside. Peel the potatoes then cut into 2 inch pieces. Heat a large pot with water over medium high heat. Once it begins to boil add in the squash and potatoes. Cover and boil for 15 minutes. 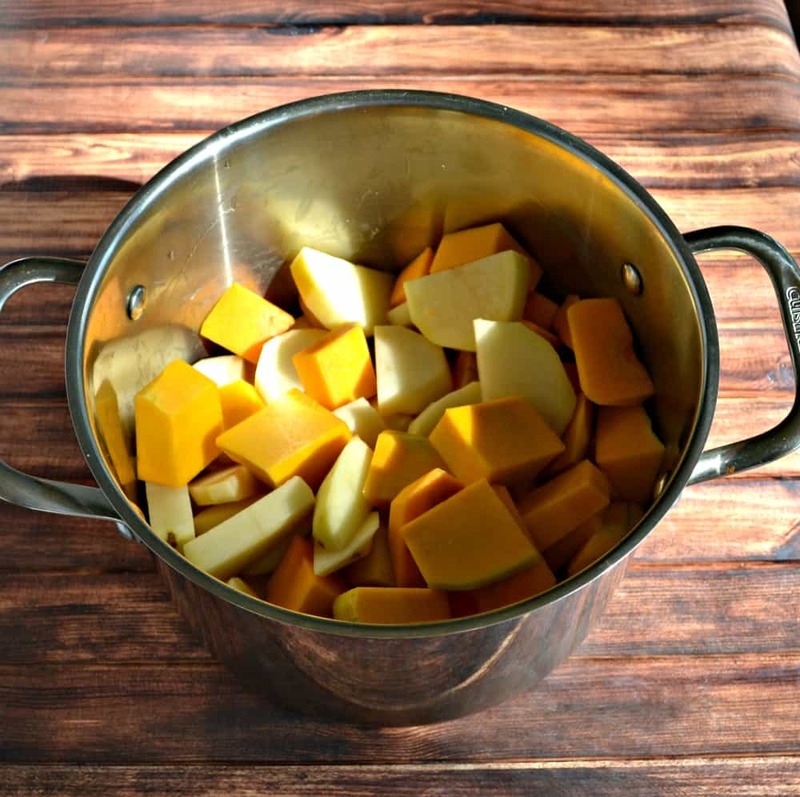 Drain the potatoes and squash and return to the pot (or place in a large bowl). Using a hand mixer, beat the potatoes and squash until mostly smooth. Add in the milk and butter and mix until combined. Add in the chives, parsley, salt, and pepper and mix by hand. Serve hot with additional butter and chives. 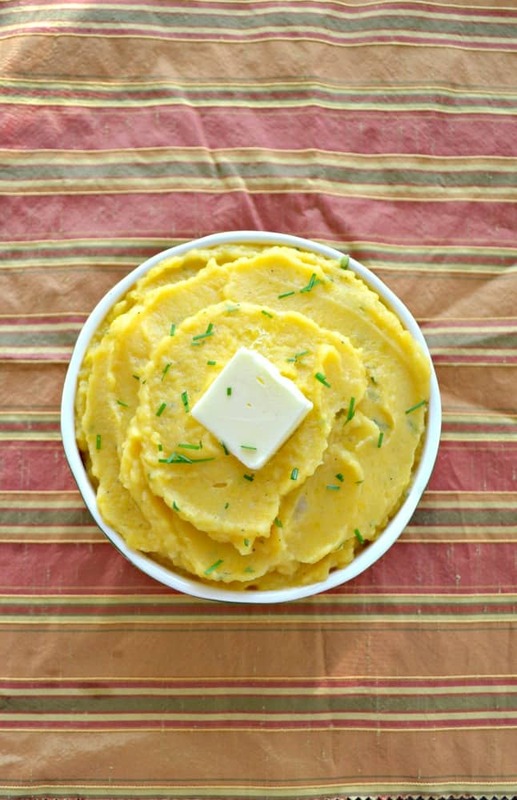 Mashed potatoes are one of my favorite foods! I will add some butternut squash next time, sounds like a great addition. 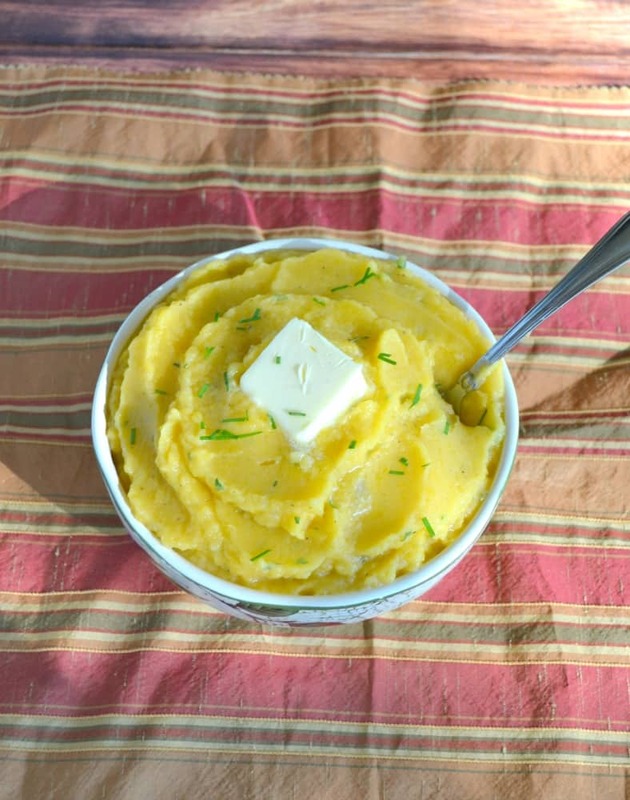 If you have a potato ricer, those make the smoothest mashed potatoes! Be careful of overmixing with something like a hand mixer, potatoes go gluey very quickly if overmixed.